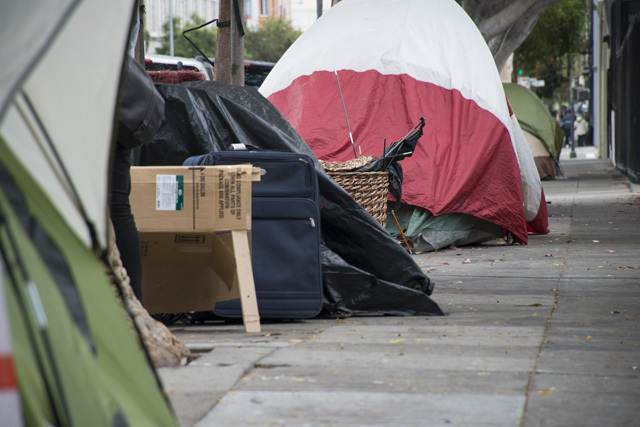 A homeless encampment around 15th and Treat streets in the Mission District has been partially cleared despite the fact that the city is short on beds in which to place them. The area, which was scheduled to be cleared by today, has been split into two smaller areas to work on piece by piece, said a spokesperson for the city’s Department of Homelessness, Randy Quezada. On Tuesday, tents were cleared from Harrison Street between 14th and Alameda, Alameda to Treat Avenue. In the coming weeks, the area of focus will be Alabama Street between 15th and Florida streets. Twelve individuals from the encampment slated for removal today have been assigned to a Navigation Center, and two to a shelter. Quezada said he did not have an estimate for how many had been in the encampment total, but guessed 10 or so had simply moved on to another area. It has become clear, however, that clearing the encampments is difficult because so few shelter options exist and Supervisor David Campos called this week for a hearing on December 1 to examine the process. “[T]he Homeless Department tells us that the system just doesn’t have sufficient beds, even with the opening of new winter shelter beds,” Campos wrote in an email to constituents this week. The encampment resolution teams working to clear the encampments, he wrote, face a challenge: there is no place to put them and the hearing will seek new options. “Resolving” an encampment, as the department calls it, is a multifaceted process that takes several weeks in which Homeless Outreach Team members try to build a relationship with campers and figure out each individual’s specific need leading up to the encampment removal date when Public Works crews arrive to clean up. One of the individuals who went to the Navigation Center, Quezada said, had been homeless and on the streets for 15 years – the city will be trying to connect him to the appropriate benefits and perhaps even permanent supportive housing while he spends a month at the shelter. Though there are, as of most recent count, 922 people on the waiting list to get into one of the city’s shelter beds, the encampment resolution team has a small number of beds reserved for moving people out of tents and into shelters. A woman who was eight and a half months pregnant and living in the encampment, Quezada said, went to the Navigation Center and was connected with prenatal services. “A lot of the success we had was due to the work of the HOT teams and getting to know the needs of the folks there, and being able to figure out the strategies that were going to work,” he said. Homelessness may also be resolved by alternate means – finding a family member willing to take someone in and getting them a bus ticket there through a program known as Homeward Bound, for example, or resolving a dispute that may have led to someone’s eviction so that they can move back in. None of these alternatives were employed at the 15th Street encampment, Quezada said, though they may come into play as the department works on the second half of that area in the coming weeks.